Club Medellin and Light Bar is located in No 4 Nemanjina Street, in downtown. This club consists of two parts, cafe Medellin and Light Bar, with total capacity of 150 people. Cafe Medellin accommodates around 50 people and Light Bar 100 people. Cafe Medellin is opened 7 days a week as a coffee shop from 8 am until 4 pm, and as a club from 10 pm to 8 am in the morning. As a coffee shop Medellin is ideal for a pleasant talk with friends and a cup of coffee, while in the evening this place transforms into the underground club. While Light Bar works 7 days a week from 10 pm to 8 am. Weekends in Light Bar have became famous for great and unusual parties. But on weekends, this club has two parties, which makes it an unique place in Belgrade. First party is from 10 pm to 5 am, and after that the party continues as after party from 5 am to 10 am. This whole concept makes this place one of a kind. 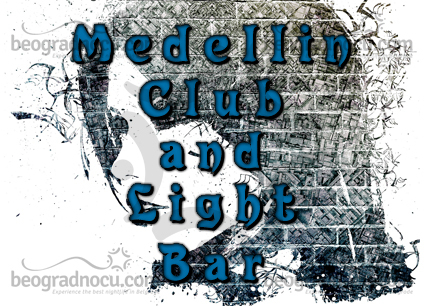 Club Medellin and Light Bar is a place for young, urban people who enjoy domestic and foreign commercial music, Psy Trance, Acid Funk, House & RnB. This club is just a right address for all party lovers and with its specific interior is very attractive. So if you want to spend an unforgettable night out, you should definitely come here. This underground option, which is available for you in this club will provide to enjoy several music genres only for night. Specific charm of this place, is it transformation, from cozy coffee shop, where you can relax during a day reading some mainstream magazine, and over the night it takes mystical touch and becomes true underground club. Club Medellin and Light Bar, offers something really different comparing to other clubs in Belgrade. So if you are curious person, you should stop by. So weather you want to stop by, during a day to have a cop of coffee, or at night for a crazy party, you are welcome. This club can be a true revelation for you, don not miss it!